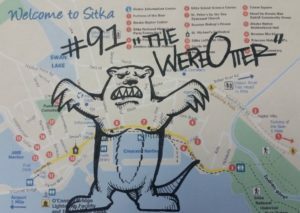 We’re taking a trip to the seaside town of Sitka, Alaska this week to discuss (arguably) the most adorable cryptid we’ve ever covered. The Kooshdakhaa are a mythical shape-shifting race of were-otters found in the stories of the Tlingit and Tsimshian Indians of Southeastern Alaska. Vicious soul stealing monster or cute and cuddly life saver? I’m still waiting on an email response from Charlie Sheen…..
We’ll visit the Fortress of the Bear for an up close and personal look at these incredible Alaskan Bears. Set against the Tongass National Forest, this habitat offers daily tours. Learn the challenges they face as the staff work to rescue these incredible giants. And I think Amy has found her spirit animal. We’ll stop for a bite at the Bayview Pub for a delicious Elk burger. Tony and Patricia have created a warm and welcoming restaurant sourcing their seafood fresh from the docks. Harley may scoff at the deliciousness of it but Amy is ready for some Rockfish tacos-served grilled, blackened, or house-dipped beer-battered and fried. With the largest selection of beer in town and 10 TVs, we may just have to move in. We’ll honor a true Iditarod hero in the top 5 and learn what not to do with a moose.